*18+. New customers only. Min £10 total stake on qualifying games. £10 Bonus, subject to 24x wager req. £10 Free Spins (20p each). £10 Golden Chips (£1 each). PayPal, certain deposit types and countries excluded. All bonuses valid for 30 days (bonus and winnings removed) on selected games.T&Cs Apply. You can read more details here. Learn from experts about the best roulette strategies! Roulette is the casino game all serious gamblers want to master. We’ll tell you why you should never play American Roulette, give you intricate strategies for European Roulette, tell you where to play and describe tactics professional players employ to get an edge over the house. What do we mean by “best” here? We at Roulette Geeks are committed to providing our visitors with transparent information about roulette strategies and where to find interesting roulette offers online. This means that our team of writers and researchers is always browsing the web to provide you with the data you need in your search for the roulette offers that work best for you. In the end, the final decision is always yours! You decide which casino you find the most promising. What we label as “best” here always reflect our subjective opinion, so take your time and browse Roulette Geeks to find the offer you like best! Pro tip: set yourself limits based on how much you would like to win. Test your chances of winning using our simulator. Remember, good luck comes from having the edge and knowing where to stop – and knowledge is your natural advantage. This role is automated in the online Random Number Generator (RNG) and Live Dealer versions of the game. The aim of roulette is to predict which numbered pocket the roulette ball will end up in once the wheel has stopped spinning. You bet using chips which you place on numbered spots, lines, boxes or junctions on the gaming table. In roulette, players bet against the casino (known as ‘the house’), not against other players. It should come as no surprise that the house has the edge when it comes to the odds of winning. 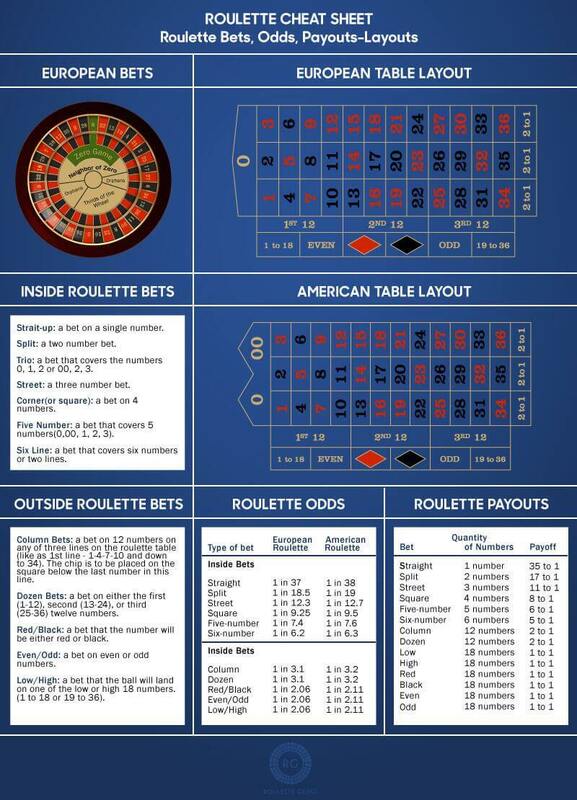 You can check out roulette game odds in the player vs. house odds infographic. Let’s talk about the elephant in the room: American roulette. With American roulette you play with a zero and double zero on the wheel/table. On a European roulette wheel, there is only zero, and no double zero. This means that the house edge for European roulette is significantly better for you the player at 2.70% compared to 5.26% in American roulette. Simply put, you’ll get ripped off playing the American version of the game. If you want to beat roulette, don’t do it. Ever. Always go with European roulette, Roulette Geeks recommends. 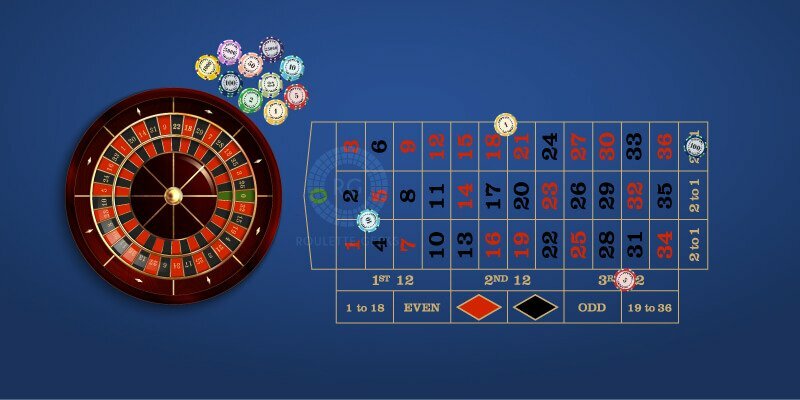 As discussed above, we know there are two distinct and commonly played types of roulette in online, mobile and bricks and mortar casinos around the world. The first, European roulette is, as the name suggests, most commonly found this side of the pond. It only differs in one small but key characteristic from its sibling.European roulette wheels have only one pocket for zero whilst American wheels and game tables utilise a zero and a double zero. That rather tricky addition favours the casino significantly and as we’ve already discussed should act as a red flag to you, the astute player. Infographic 1 below shows some of the key differences between the 2 games types and player vs. house odds. 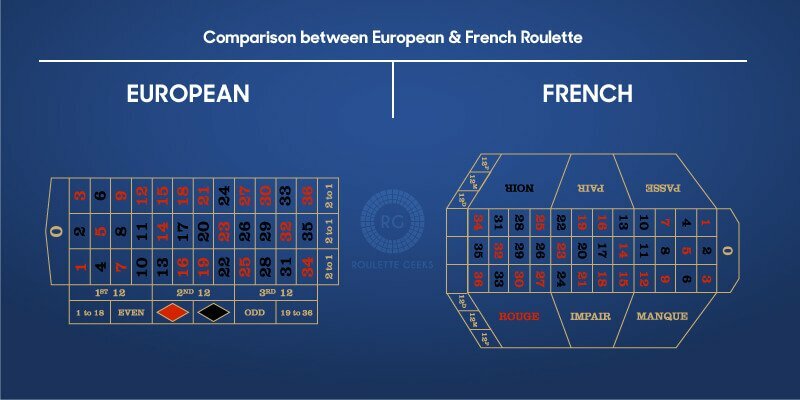 In addition to the different roulette types and wheel configurations between American and European roulette (which, incidentally, have the same game grid layout with the exception of the extra zero) there is also a table variation known as French roulette. French roulette is like European roulette in many ways: most importantly the the number of pockets in the roulette wheel are identical. There are two differences. Firstly, and unsurprisingly considering the name, the words on the table are all in French. Secondly, the French version of the game uses the ‘La Partage’ rule, by which you only lose half your even-odds stake if the spin is a zero. In real casinos, the roulette wheel is three feet across; online its size depends on the platform you’re playing on, your device, screen size and resolution. There are 38 pockets on an American roulette wheel and 37 on a European roulette wheel. The difference is due to an American roulette having a zero ‘0’ and double zero ‘00’ while European roulette has just one zero. Half the pockets are red, the other half black, while the zero and double zero are green. The colours alternate between black and red around the wheel, only interrupted by the green zero and double zero. On first glance the numbers appear random. However, numbers directly opposite each other are always consecutive, meaning odd red numbers are usually opposite consecutive black numbers. On the European roulette wheel, the number sequence is 26, 3, 35, 12, 28, 7, 29, 18, 22, 9, 31, 14, 20, 1, 33, 16, 24, 5, 10, 23, 8, 30, 11, 36, 13, 27, 6, 34, 17, 25, 2, 21, 4, 19, 15, and 32. On the American roulette wheel, the number sequence is 0, 2, 14, 35, 23, 4, 16, 33, 21, 6, 18, 31, 19, 8, 12, 29, 25, 10, 27, 00, 1, 13, 36, 24, 3, 15, 34, 22, 5, 17, 32, 20, 7, 11, 30, 26, 9, 28. The objective for you, the player, in the game of roulette is to predict where the roulette ball will land in the slotted wheel. This prediction could be the exact number, the red or black colour segment, whether the number is high or low or if it’s even or odd. Most games involve a combination of these roulette types of bet. Step 1: You (and other players) lay their chosen value of chips as bets on the table in a numbered, coloured or even/odd box. Step 2: You can additionally select a line or intersection of lines to spread the bet wider (see the graphic below). In this instance, the total win will be reduced but the chances of winning increased (Read more about bet options, win rates and payouts in the Roulette Betting Types section below and also the Roulette Glossary at the bottom of this page). Step 3: When all bets are placed the wheel is spun one way with the ball sent in the opposite direction. Online roulette games allow the player to click a spin button to initiate the game. Step 4: You (and other players) can move your chips to change bets even after the ball has entered the wheel in every roulette game. Step 5: When the ball moves from the outer rim towards the numbered wheel pockets the croupier (or in online roulette the table instructions) then calls “no more bets”. At this point, no bets can be changed nor new bets placed. 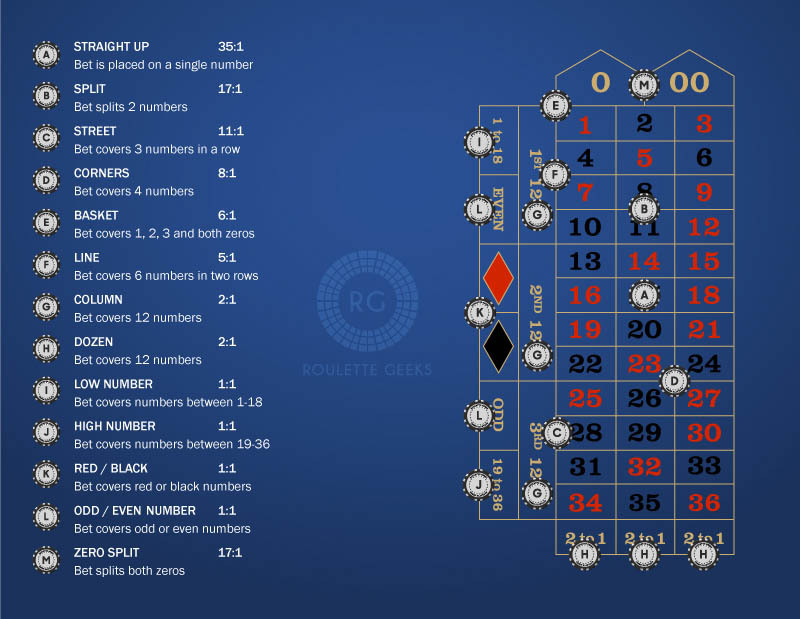 Step 6: Once the ball stops in a numbered pocket the croupier or RNG software will place a marker on the game grid indicating the winning number. Step 7: The croupier or software collects all losing bet chips from the table and pays out all winning bets. In online roulette this happens automatically. Too much to remember? Not a problem. We created a ‘cheat sheet’ as an aide memoir for the basic roulette bets, odds and table positions. 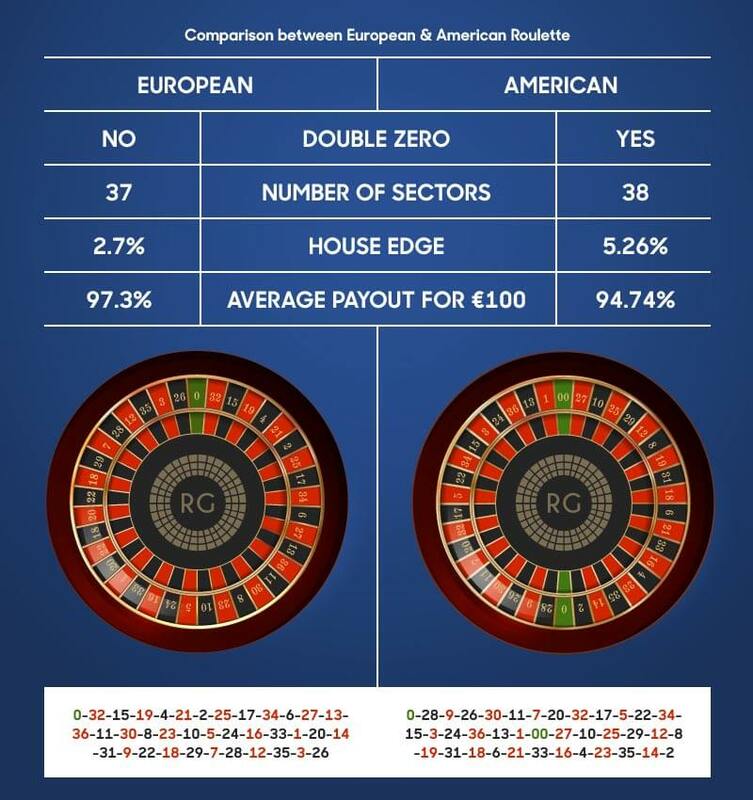 On European single zero roulette tables the house edge is 2.7%. On an American double zero roulette table it’s 5.26%. The house edge is gained through these zeroes – otherwise you would simply be able to coin flip ‘red or black’, ‘high or low’ and ‘odd or even’ to get even money. You can see the odds of winning different types of bets in American and European roulette in the table below. To better understand the house edge in terms of roulette win percentage and probability it’s worth referring to this well researched website by Jacob Kanzen. The house always wins (eventually). Both land based and online casinos wouldn’t exist if, over time, they weren’t assured a winning edge, so be mindful that over time the odds are stacked against you. Changing strategy mid-game. Disorganised or haphazard gameplay is unlikely to do anything other than burn your bankroll. Impatient bettors who chase their losses. As above, organization, patience and game awareness are essential if you are to hone best practice strategy in roulette. Lack courage. First of all, don’t misinterpret courage for bravery. Courage is holding back and betting small while your luck’s down as people round the table clean up. Bravery is going broke chasing the summit in the wrong conditions. Choosing wrong strategy: Make sure to select a roulette system that suits your bankroll, risk-willingness, game style, and win objectives. You can do this by looking at the key tactics to winning online roulette, reading our 12 roulette strategies, and/or trying out roulette strategy simulator. There are two main types of bet in roulette: inside bets and outside bets. Inside bets are any bets placed on the numbered segment of the game grid, including bets on lines and intersections. Outside bets are those placed in the boxes outside the numbered game grid, including red or black and odd or even boxes. You can see inside and outside bet segments in the table graphic below. Red: betting on the ball landing in any red pocket. Black: betting on the ball landing in any black pocket. Dozen: betting on either 1 to 12, 13 to 24 or 25 to 36, thirteen through twenty four, or twenty five through thirty six . Here are some of the most frequently employed tactics and strategies to legally win when playing online roulette. First and foremost, we must acknowledge that there is not one straightforward “beat roulette” strategy. Our role here at Roulette Geeks is rather to provide you with some new ways to go about your roulette routine. We cannot guarantee that any of these tips will make you win at roulette. They are only pointers and certainly not “roulette cheats”. Always gamble responsibly! 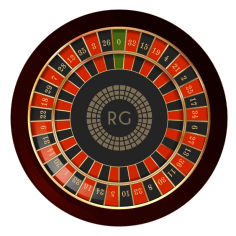 A dealer signature is what happens in live roulette when you work out that the croupier is consistently ‘aiming’ the ball so it regularly ends up in a similar segment of the wheel. If this happens you are able to align your bets accordingly to cover that segment on the game grid. This enhanced knowledge will allow you to beat the house and come out in a positive winning position. Although this is impossible on an RNG or mobile casino an online player may try to calculate a signature whilst playing live dealer roulette (see the Live Dealer Roulette section for more information). 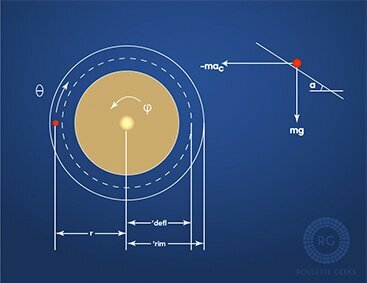 With reference more to live roulette than online (although again it might be feasible for you when playing Live Dealer Roulette) ‘roulette physics’ was a term coined in the ‘70’s by American maths wizard Doyne Farmer. 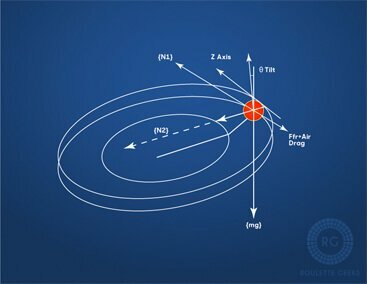 More recently, a study in the journal Chaos by Michael Small and Michael Tse outlined statistical models that could help to calculate a roulette ball’s end pocket from the speed and trajectory of the spinning wheel using high-speed cameras. Whilst the speed of the ball and wheel spins are predictable, the bouncing of the ball as it nears the pockets is nearly impossible to ascertain in advance. Using a manual method, however, the paper’s authors predicted which half of the wheel the ball would land on with some accuracy, and on some spins predicted the exact number. This improved the player’s odds to 18%, an increase from the 2.7% in the house’s favour. Chaos Theory is one of the most intriguing and complex of all scientific theorem. In the context of a highly complex roulette wheel environment, all you need is an edge over the house to win. No matter how small, an edge played consistently over time will generate profit. The Chaos Theory’s usage in Live Dealer and live casino roulette shares many similarities with the Physics of Roulette system outlined above. A player looking to achieve an edge in the chaotic spinning of wheel and ball can consider the entry point of the ball, the speed the wheel is spinning at and any bias the table has shown towards certain pockets on previous spins. Put this data together and you would theoretically be able to enhance your edge. For those of you who want to explore the physics and Chaos Theory behind ‘winning at roulette’ you can read the 1994 paper by Mark Anthony Howe here. For anyone to whom this is a step beyond your scientific capabilities, we’ll also explore some of the more player friendly roulette tactics and strategies to win at roulette in the section titled Winning roulette strategies and systems. There’s no such thing as ‘pure luck’ in roulette. The perceived chance of beating the house can be ratified through what is known as standard deviation (SD). The SD of roulette can be worked out through the ‘binomial distribution of successes’ (given that 1 unit = a win, and 0 units = a loss). The line of thought behind this theory is that over a large enough number of spins the outcome will follow the same normal distribution curve. After enough spins (n), the theoretical distribution of the different outcomes will converge to the normal distribution. This gives you a good opportunity to forecast the possible win or loss. Let’s take an example: after 1,000 spins, the ball lands on red 55% of the time, significantly away from the predicted 48.65% times. 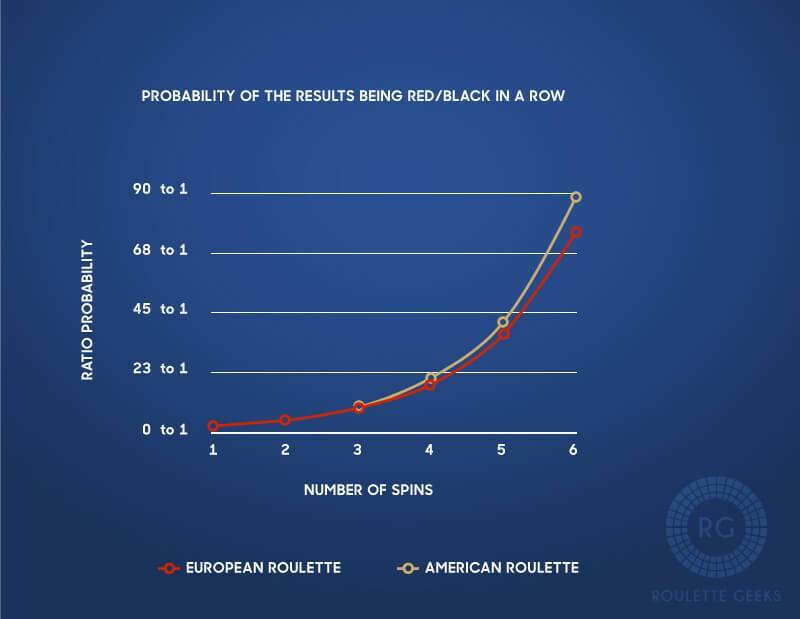 This means, according to the theory, that you should start betting on black as the normal distribution of roulette spins is predicted to be 48.65% red, 48.65% black and 2.70% green after a large amount of spins. In other words: if you see one type of outside bet dominating the others, you can expect the roulette wheel to be “in debt”, which will even out over a large enough number of spins. Someone Has to Win at Roulette – why not you? There is a tautology that exists in online roulette – if no one ever won, then the liquidity of every site would dry up and operators would go bust. As such, somebody has to win! For all the information above about chaos theory, roulette physics and standard deviation, there are some simple roulette tips, tactics and tricks that any player can start playing close to ‘perfect strategy‘. The players that win more than they lose in roulette usually follow the following 3 rules of perfect roulette strategy. You can twin these tactics with any of the roulette systems listed in the Winning roulette strategies and systems section further down this page, including Martingale, D’Alembert, Fibonacci and La Bouchere systems. You might be playing for practice or simply to get to understand the longer-term parabolic curves of roulette better, in which case stick to outside bets and bet small. Then, on the days when you’re bankroll is ready and you have the time to commit to a longer session you can revert back to your standard strategy without having lost your shirt. There’s no prize for winning fast, only for winning, so variations in your game and strategic management control is a vital weapon in your armory. Many experienced roulette players with a good knowledge of the statistical geography of the game only choose to play inside bets for the additional win opportunities and higher volatility they offer. Casual players who are learning the game should stick to the more balanced (i.e. in the short term, forgiving) outside bets of odd/even and red/black. If you have the patience, numerical awareness, stake control and decent bankroll then inside bets offer greater risk, but with that a greater potential return. Don’t be hasty or impatient – you’ll bust yourself before your strategy has even a slim hope of coming good. And don’t, whatever you do, chase losses. This is a gambling game – if anyone could predict it over the short term it simply wouldn’t exist. So bet within your means, which will allow you to roll with the inevitable punches that a poor run will give you. Then, when the tide turns, maintain a solid betting profile. Roulette success is a hare and tortoise race and yes, the hare tends to die before the finish line. Some days your luck will be running cold and it’s at times like these that the astute roulette player steps away and limit their losses. If you want to try out one of the strategies go to Winner Casino. If you want to know more about Roulette tricks and tips from experts, read more here. Online roulette software is dominated by 10 – 20 major players, with Tel Aviv based Playtech leading the pack. Other notable operators include NetEnt, Microgaming, Nyx, Openbet, IGT and Williams Interactive. Most roulette games you find online will have been developed by one of these firms, and as licensed and regulated entities in White List jurisdictions your money will be safe. You can read more about the leading platform providers and operators here. One popular operator for online roulette is the bet365 casino which offers a bonus code for all new customers (18+, T&Cs apply). To operate a legal, regulated online roulette business in the UK (or other regulated European markets) an operator must sign up to be regulated by a licensing jurisdiction. Below we’ve listed a subjective leaderboard of the best of these categorised by tier 1 and tier 2. Before you deposit any funds into a gaming account to play roulette we’d suggest you check that the operator has one of these, preferably tier 1. There are so many online casinos out there that offer different types of roulette games. Unfortunately, a lot of these casinos are very poor or outright scams. We have created lists of different online roulette casinos that are good, safe and fun to use. For a detailed summary of all regulated casino and roulette sites you can browse through the hundreds of expert reviews at bettingexpert.com. Here too, we must emphasise that these are just different ways to play roulette – we cannot guarantee wins with these roulette strategies. The Martingale strategy (also known as the Mayer technique) originated from necessity – how could a gambler, bettor or tradesman guarantee their investment would end up winning no matter what happened to the market? Simple – you double your lost bets until you hit a win, meaning you will always recoup your lost bets. If you employ the Martingale strategy you should have a one hundred percent winning probability. However, anyone who applies this strategy successfully must have an infinite bankroll. Theoretically it’s perfect. In actual fact, it’s very, very flawed. You can experience the likelihood of different outcomes with the Martingale strategy in the Interactive RouletteGeeks Strategy Simulator. Want more? Read an in depth appraisal on the Martingale system. This is a positive version of the Martingale system (also known as the reverse Mayer technique) where you double your bets after each win and stop betting after each loss. Equally risky in the long term, the trick with the reverse Martingale is that, in the words of Kenny Rogers, “…you got to know when to hold’em, know when to fold ‘em, know when to walk away, know when to run’. In simple terms, if you successfully double your wins, it won’t go on forever, so bail out while the going’s good. Named after Jean-Baptiste le Rond d’Alembert, a French gentleman who wrongly believed that the more a coin flipped to ‘heads’ the more likely it would land on ‘tails’ thereafter, the D’Alembert system dictates you start with an even bet (on odds for example), staking £5. If you win that game, you keep the stake the same for the next game, but if you lose you have to increase the bet by the same £5 amount. So if you lose that £5 bet on the first round of roulette, you would then have to stake £10. If you then lost that bet, you would have to bet £15, the original stake being the concurrent unit. On the flip side, when you win you decrease your bet by one unit, in this example £5, but you never go lower than one single £5 bet. In theory, you would win about the same amount of stake money as you lose. If that happens you should come out in profit at the end of the game. Like the regular Martingale system, this system needs to be managed with mink gloves to ensure that when the ball misbehaves you aren’t bankroll committed. You can experience the likelihood of different outcomes with the D’Alembert strategy in the Interactive RouletteGeeks Strategy Simulator. Want to know more about the D’Alembert system? Read this scientific paper. The Contra D’Alembert system (to give it its formal title) uses even money bets like red/black, high/low and odd/even in roulette. Similar to the Martingale system, you bet a stake and double your bet in each game you win, whilst halving your bet of you lose. So a bet of £20 that won dictates a stake of £40 off the back of a win and a stake of £10 off a loss. Very simple, quite fallible – but on a good run very profitable. 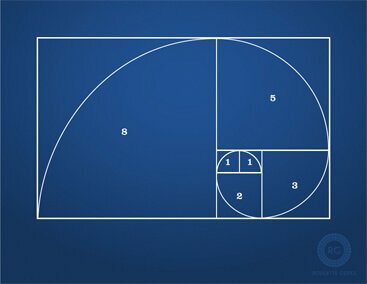 When you start using the Fibonacci System, you start on the second “1” to the right side of the middle. You then place a £1 (or 1 unit, depending on your bankroll) bet. If that bet loses, you move one place further (counter-clockwise) on the curve in this example, to the number ‘2’). If the bet wins, you move two places back (clockwise). In this case, you would have now successfully completed the sequence. If you get to 2, you bet £2 (1 + 1). Your aim and ultimate profit goal is to keep moving clockwise until you get to the first number – the first ‘1’ in the diagram. You’ll have made a £1 profit on the series, and can start a new series – starting from the second number from the left once again. To learn the strategy you should check out this video and you will learn much more about the Fibonacci Roulette Strategy. 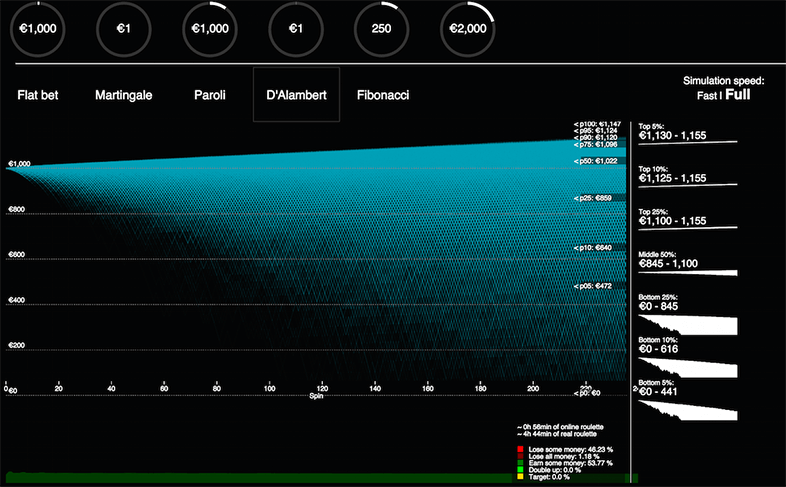 You can experience the likelihood of different outcomes with the Fibonacci strategy in the Interactive RouletteGeeks Strategy Simulator. Like the Martingale system above, the Labouchere system suggests you’ll bet even money outside bets like red/black or high/low. However, the Labouchere system requires you to jot down sequences of numbers to utilize it. Then repeat the scenario on the next spin, again adding the first and last numbers. 4 + 4 gives 8, so you’d bet £8 on ‘odd’. Should that win, you have a 6 left on your list, staking this on an outside 50:50 bet accordingly, for example ‘High’. If you’re lucky enough to win that bet too, you’ve covered all the numbers in your sequence and have completed the system. Your winnings should amount to £20, assuming you’ve made no inside bets. You can read more about the La Bouchere system in this very detailed book. Or watch simply this video which explains you the system. As with other famous systems, this is not a case of aiming for wins, as in the original Labouchere system, but mitigating losses. When every number has been erased, you’ve lost and have to start again with a new set of numbers. You need to stop when you’ve won a predetermined amount. You can read more about the Reverse La Bouchere system here. American writer Allan Wilson coined the phrase ‘Oscar’s Grind’ after meeting a roulette player whose system relied on roulette bets never getting too big – he simply grinds out a small win every day. Again it’s an even money, outside bets system that applies to European roulette for the beneficial player edge against the house. To play the Oscar’s Grind system you bet with £1 but then don’t increase your stake until you see a loss and subsequently increase your bet to £2. Your bets should stay at £2 until you’re in net profit at which point the bet should go back to £1, or, if there has been a series of loses and then a win increase to 3. Bet £1 and win: You are up £1 and keep wagering £1. This string wins so we start a new string from scratch. Bet £1 and lose: You keep wagering £1 until you see a win then the bet is raised to £2. If you see a string of losses and then a £1 win unit the bet is raised to £2, then another win at £2 but the string is still in negative equity so the next bet should go up to £3. Carry on through to £4 and higher if the string is still in negative profit. As with other simple systems mentioned above the Paroli System relies on you placing outside even money bets on roulette. The system is very simple to employ and whilst it won’t make you Lottery wins in returns it is a useful bankroll management system that can help exploit positive runs in luck whilst mitigating negative runs. To understand and then utilize the system, assume you have a £200 bankroll that you’re happy to play with £5 as your standard bet per game. If the first bet loses, then maintain the same stake for the next game. If you win that bet, then double the stake to £10. In effect, when you lose go back to your original bet amount and when you win you should double your bet. If you win three bets on the trot, immediately go back down to your original £5 stake. 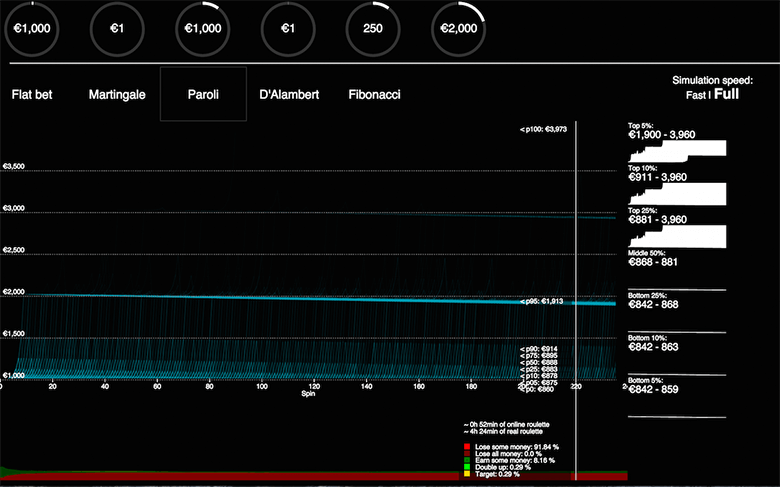 The Paroli System is based on likelihood – and the fact that lucky runs tend to be shorter rather than longer. This system bails you out of a winning run before you lose your earnings. You can experience the likelihood of different outcomes with the Paroli strategy in the Interactive RouletteGeeks Strategy Simulator. 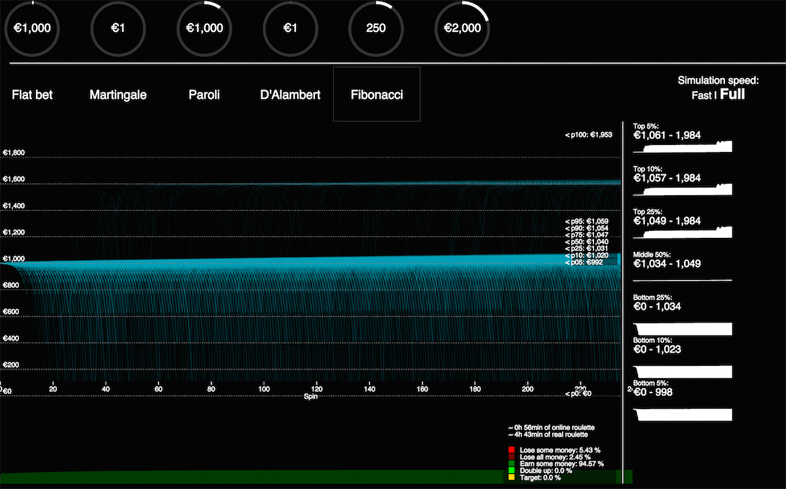 You can read a more detailed review and guide on how the play the Paroli system here. When you win, you win small as you’ve covered the table. When you lose, you lose big. Simply put, this is not a tactical, useful, sensible, intelligent, astute or winning strategy for playing roulette online. Leave it to the Vegas holidaymakers with too few chips and too many Mojitos. Flat betting is simply betting a set amount on every spin. You may have employed some elements of strategies or systems outlined above, or you may simply have lucky inside bet numbers in mind. Either way, whilst flat betting, as long as you follow the 3 Rules of Perfect Roulette Strategy for bankroll management and bet selection, you should be able to avoid the hard times whilst making hay in the sunshine. You can experience the likelihood of different outcomes with the flat bet strategy in the Interactive RouletteGeeks Strategy Simulator. So what is the best roulette strategy, you are wondering? There is no right or wrong answer to this question. There are no strategies that can guarantee you win (authors selling such strategies are lying), but different strategies come with various risk levels. Strategies like the reverse martingale are high risk strategies, entailing that you can win big on this strategy. There is, however, also a large risk of losing your bankroll. Contrary, the Fibonacci roulette strategy is low risk. It’s rare that you lose all your boney, and equally rare you get a big win.But if you can live with smaller wins, this might be right for you. We encourage you to spend some time with our roulette strategy simulator to better understand how risky different strategies are. This is the only true way for you to find the best online roulette strategy. This point about no superior strategy is a bit different to other games such as Blackjack and Craps, where you can influence the overall payout rate – and thus chance of winning – through your selections. As we’ve discussed above, consistent roulette winners have one thing in common – they manufacture some kind of edge over the house. Some players believe they can utilize technology to enhance their edge, the most common of which are Roulette Bots. These ‘robot’ software systems sit on your computer or tablet and calculate the perfect strategy for you as you play. They apply your bankroll, betting limits and the game permutations to recommend your next bet strategy. Bots attempt to use roulette algorithms to predict the outcomes of spins (see below segment for more information on algorithms). Method 1 – Sleepers: Waits a number of times determined by the player for a category to miss, then bets on that category. Uses Martingale progression or a player’s own progression system. Method 2 – Reverse Sleepers: Waits a number of times determined by the player for a category to repeat, then bets on all the bets in that category except the one that has repeated. 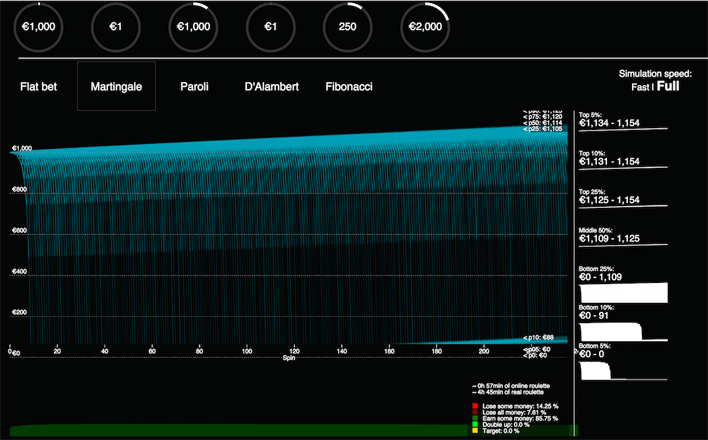 Uses martingale progression by default or you can program your own customized progressions. Method 3 – Super Singles: Proprietary flat betting for single numbers without progressions. This method waits a predetermined number of times inputted by the player as data history. Uses “Y” (user defined) numbers to bet on as sleepers, repeaters or sometimes both. Method 4 – Proportion Probability: Tracks bet hits within a predetermined spin cycle before betting on numbers that complete the cycle when proportional probabilities of a winning % and positive anticipated value is in favor of that bet. Method 5 – Progression Recovery: This option can only be used in conjunction with the reverse sleepers system. It allows you to recover any loss over “X” (user defined) times on 2 different levels. Obviously if roulette bots guaranteed consistent wins then roulette would have ceased to operate as a betting game many years ago. However, you may want to use software like this to help with your bankroll management and game strategy. You can delve into ball spin dynamics and wheel spin mechanics – some of this information is interesting but holds little use in an online roulette game. You can read more about game algorithms and spin mechanics here and you can also read a more in depth account of roulette algorithms here. Most online casinos also feature a live casino where customers can play roulette in the live environment. Whereas an online casino provides a virtual experience live roulette is more akin to playing table games in a bricks and mortar casino. The croupier is a real person and often an attractive female to add to the glamour of the occasion. There is a real wheel and table and the croupier spins the ball. Players are allowed to communicate with the croupier and chat to other players to make the experience more authentic. Players can take part in live roulette and other table games such as Blackjack and Baccarat The action takes place in a real studio and it is streamed to members who place bets via their computer screen or mobile device. Formats of roulette like as the European and American version can be played in a live casino. If you want to know more about banking options for Roulette online Casinos, please read more about it in our banking section. Especially PayPal is a banking option that is popular among casino players. We have found the Top Roulette Casinos for PayPal. Also Bitcoin Casinos are becoming more and more important. That is why we have made an overview of the most popular Roulette Online Casinos with Bitcoin. Listed below you’ll find some of the most useful roulette terms and definitions that may help you master the game. Backtrack – the outer circle or rim of the roulette wheel in which the ball spins. It can also be called the ball-track. Bet Types – You can see a description of bet types in the table below. Biased Numbers – these are numbers that repeatedly turn up in the game, caused by an unbalanced roulette wheel. Big Number – A number that features more than is statistically feasible, often caused by a biased wheel. Black Action – You bet with a $100 chip. Black Bet – You bet the color next to a black number. Bottom Track – The area inside the back track where the ball goes before settling into a numbered pocket. Carre – The French name for a corner bet. Chameleon Strategy – You spot a player on a winning streak and follow their betting patterns to try and emulate their success. Chasing Losses – You increase your stakes to try and mitigate their losses. Cheval –The name of split bet, originating in France. Choppy game – Neither you nor other players around a roulette table are winning or losing consistently. Column bet – You bet on one of the columns of numbers in the game grid. Corner bet – By placing a chip or chips on the corner of 4 numbers the player covers each number for a lesser return than covering the numbers individually. Double zero or 00 – The ‘house edge’ zero numbers in American Roulette. Dozen bet – You bet on any three sets with twelve numbers. En prison rule – You make an outside bet (odd/ even or red/ black) and the ball drops on zero or double zero, you have the option to lose half the bet or retain the money at stake ‘en prison’. This means you leave it on the table for the next spin. Mostly seen in European roulette. European roulette – The game type in which the roulette wheel which has 37 numbers including a single zero. This means you have a proportionally greater chance of winning than American roulette. 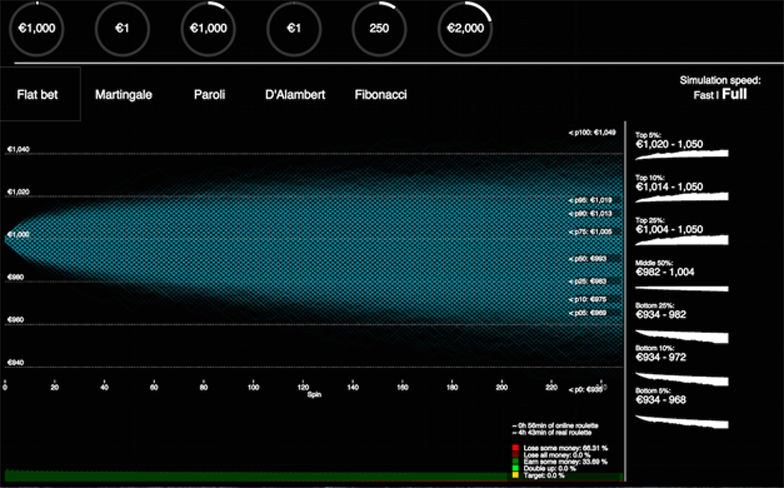 Fibonacci Betting System – A system of betting on roulette that relies on an incremental pattern of increasing numbers. Five number bet – You bet on zero, double zero, one, two and three in the same game – more frequently seen in American roulette. House edge – In any roulette game this is the % by which the house has the greater chance to win. This is dictated by the presence of the zero and double zero pockets. High bet – You place bets on high numbers only, namely 19 to 36. Inside bet – You bet on numbers in the game grid only. La Partage rule – Similar to the en Prison rule, you would lose half of the bet and not the entire bet when a zero or double zero win. 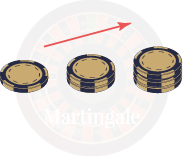 Martingale System – A roulette betting system of doubling your bet on red/ black or odd/ even with each concurrent loss. In theory, you can’t lose as you will eventually hit your bet and win back your total losses. Orphelins (Orphans) – You bet on three numbers that are close together on the wheel, but are in fact far apart on the roulette table layout. You would bet orphelins if you feel the wheel is biased towards a certain segment and those numbers are more likely to win. 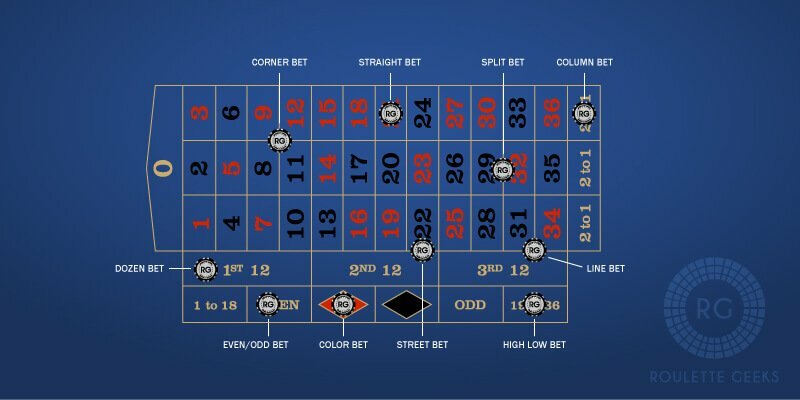 Outside bet – You bet on the outside boxes for even money including red/ black, high/ low or odd/ even. Parlay – You leave your previous game’s win on the table and with an additional bet for the next game. Pay Out – What you collect if you’ve come out cash positive at the end of a roulette session. Player Clocking – If you employ Chameleon Strategy, and then mimic a winning player’s bets. Quarter bet – You bet on one of four the 4 quarters on the game grid, similar to a corner bet or square bet. Red bet – You bet on the colour with a red number next to it. Reds – Five dollar or pound chips. Reverse La Bouchere Betting System – You play a backward La Bouchere system meaning you cancel the numbers from each loss and add them after each win. Reverse Martingale Betting System – You play a backward Martingale system by doubling up after each win. Roulette chips – The tokens with which you bet. By placing chips on inside or outside bets on the table you are committing to the bet. Once the croupier has called ‘no more bets please’ you are not able to move your chips. Roulette strategy – You employ one of a number of tactics in order to beat the game, many of which are described in detail in the section about the most successful roulette strategies on this site. Single zero roulette – Another name for European roulette. Six number bet – You bet on six numbers in one game. Split bet – You bet on two numbers next to each other. Straight bet – You just bet on one number. A long odds bet, but if it comes home you’ll win 36 times your original stake. Street bet – You bet on three numbers on one horizontal line on the table. Surrender rule – This is another name for the ‘en prison’ rule. Tiers du cylinder – You bet on a group of numbers that are close together on the game grid rather than on the wheel. Transversale – What a Street bet is called in France. Voisins du Zero – Voisins means neighbours in French, so this means you bet on numbers next to zero on the game grid. Wheel Clocking – You keep a mental or electronic record of spin results and biased numbers aiming to predict anomalies. Wheel Head – On a roulette wheel this is the segment in the middle where the ball drops into numbered pockets. Wheel strategies – If you believe you can achieve a winning edge by predicting where the ball is more likely to drop in the wheel head. Aside from roulette systems there has been a great deal of research into roulette, the game mechanics and the mathematics of chance. You can read about some of these theories through the links below. Ed Thorpe’s 1979 research paper broke new ground in defining the mathematics of roulette. Scans of the articles can be read here. Ed’s Thorpe’s article on ‘Croupier’s signature’. Ed Thorpe’s paper on the problems in using roulette systems – arguably the most useful of his academic research papers for the advanced roulette player. Roulette30 Blog – By far the best roulette lifestyle blog. Ed Thorpe’s research – Been done in the ‘70’s and early ‘80’s but most of it remains pertinent today. bettingexpert – the mother ship of online gaming information. Saliu – Ion Saliu’s in depth appraisal of roulette strategy, house edge and odds is worthwhile reading if you want to move from novice to intermediate roulette play. Roulette Training – A useful learning resource for the intermediate player. Winning Roulette – System and strategy tips that may or may not lead to a winning run. Roulette Online – An well informed blog on all things roulette. This video will help you learn all about the inner table – what bet options you have along the table itself from pairs to neighbour bets. Get a better understanding about outside bet options like red or black, odd or even and high or low – this video offers a great tutorial for novice roulette players. Like it or loathe it, Bitcoins and virtual currency are here to stay. If you want to learn more about how Bitcoin gaming works have a look at this video. They may not enhance your roulette strategy but these classic films are the bet of the best when it comes to Hollywood gambling. Pick your favourite and enjoy the best suspense and excitement you can get without playing the game yourself. Following former slots cheat ‘MrD’ this documentary looks at how players have grid (and in some rare cases succeeded)_ in beating casino table games by cheating. Using an array of signalling skills and tech gadgets it shows just how far people are prepared to go to gain an edge – ad exactly how prepared casinos are at beating the cheats and bringing them to justice. Derren Brown, TV’s famous hypnotist and all round mystical genius looks at the intricacies of roulette ad what makes the ball land where it does on each spin of the wheel. Lighthearted but with an educational core this is worth a watch just so you ave a better understanding of the mechanics of the game. Here’s a list of list of the top 7 best books written about the game of roulette, all available as hard copy or e-books at Amazon.